It really wasn't supposed to work out this way. John Mellencamp was hoping to become a painter. To help pay for art school he would sing in bands and ultimately he was discovered in the mid-seventies. Soon he would be marketed as a hot commodity leading to eventual rock stardom. That tale was told during a short documentary film shown before John's first of two sold-out concerts at the Ryman Auditorium on March 19, 2019 in Nashville, Tennessee. 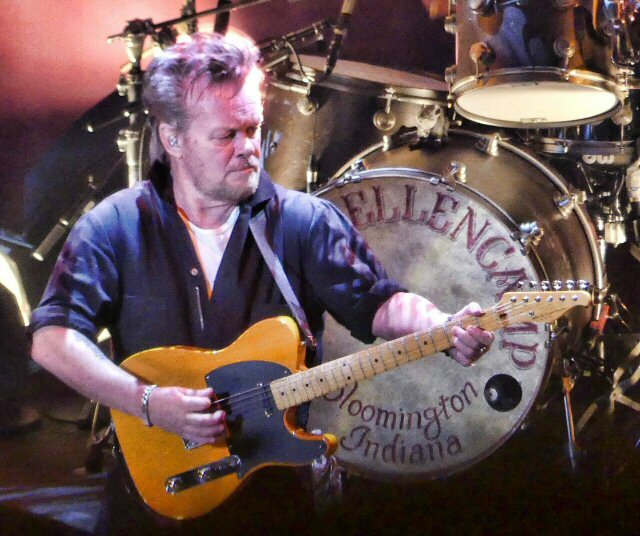 John Mellencamp played his songs and "Other People's Stuff" in Nashville. In Nashville, Mellencamp cut a figure that was reminiscent of two local icons - Elvis Presley and Johnny Cash. The latter due to his all black attire and the former because the outfit was a blue-collar style jumpsuit. With only a splash of white showing from his exposed T-shirt beneath the traditional workingman's clothes John was letting you know he sided more with the average Joe than the glamour and glitz preferred by the King of Rock and Roll. But, like those amazing legends Mellencamp had plenty of hits and rock radio staples to play for the congregation at the city's Mother Church. Like church, Mellencamp informed us that there would be plenty of hand clapping, dancing and sing alongs and some quiet moments, too. He then proceeded to lead a 100-minute revival that was full of purpose and musical manna mixed with revered songs containing both spiritual and social messages. John's own journey to become the beloved musician he is today wasn't always an easy one and the opening movie made it a point to let the audience know Mellencamp was self-aware of these facts. He let himself be conned early on into changing his surname to "Cougar" to concoct an image and obscure his small town roots. He also confessed to allowing stubbornness and selfishness to side-track his career at the peak of his momentum. A heart attack would sideline him for another three years in the midst of a comeback. 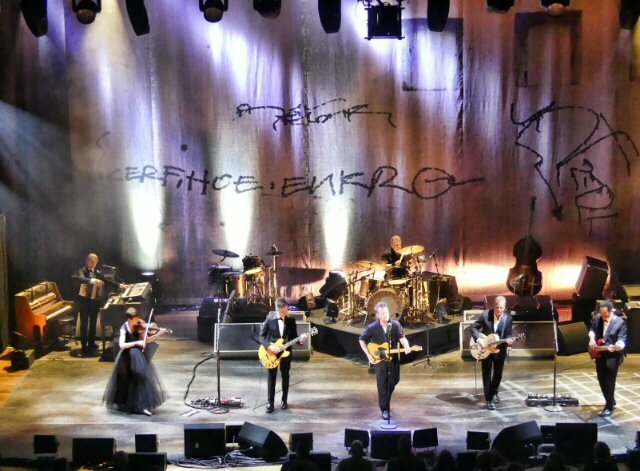 John Mellencamp and his six-piece band were impressive in Music City. Despite beating himself up a bit over these facts the heartland rocker never really slowed down and on his 24th album and latest record Other People's Stuff remains prolific as he continues his evolution from rock star to self-described "Poet" and folk singer of his generation. And, despite it all, Mellencamp did become known for his expressive impressionist paintings such as the one that adorns the cover of this covers album. But, it is his earnest pop rock confections that he would become most famous for even as they drew upon his ample visual art talent. Consider the colorful "Pink Houses" and the starker "Rain on the Scarecrow" that both contained beautiful brushstrokes that resonated with the masses as they came to life with vivid imagery during the MTV revolution of the early 80's. The stage set-up for this North American spring tour run of 36 dates was noticeably dominated by darker shades and hues perhaps reflecting these trying and uncertain times. But, the activist and philanthropist was content to let his music do most of the talking except for a quick summation of his political position as the spoken introduction to "Easy Target" that had Mellencamp professing his beliefs in equality, fairness and justice for all. 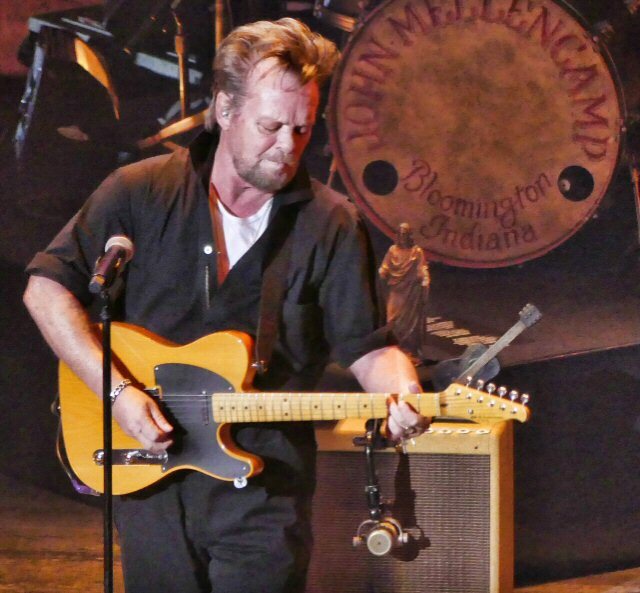 John Mellencamp led a mini-revival in the Mother Church. "I'm up from Indiana down to Tennessee," John truthfully sang in his song "Peaceful World" and Mellencamp closed the night by reminiscing about old times - specifically coming to Nashville during the early Johnny Cougar days. He told a story about having to bailout longtime bandmate, guitarist and sidekick Mike Wanchic from a Davidson County holding cell. Earlier on that same evening the pop singer had been hustled in a game of billiards by longtime Nashvillian "Minnesota Fats" to the tune of 500 dollars. Still, Mellencamp was as cool as a cue ball in Mid-Tenn as he and his talented six-piece band painted a powerful portrait of an American treasure in action. By the end of the show the one-time "Cougar" let a wry Cheshire cat smile emerge just a few times through his tough guy exterior. We can chalk that up to the fact that he was having as much fun as we were. 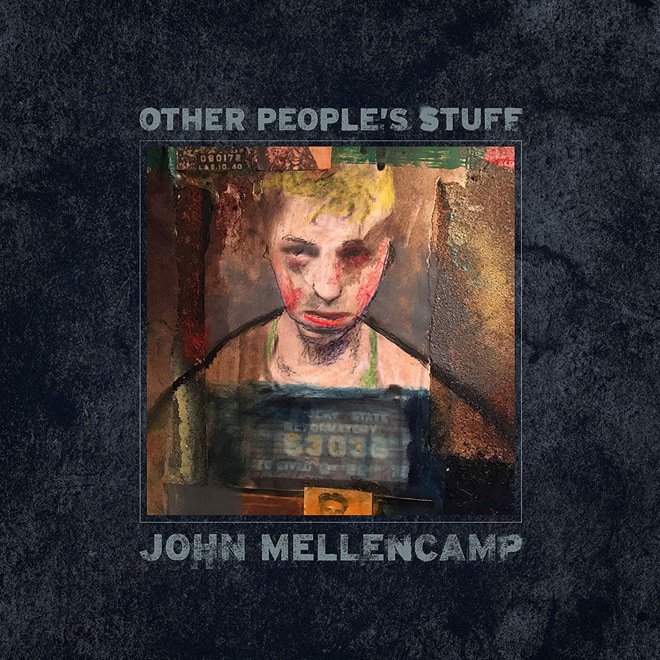 "Other People's Stuff" is the latest record from the prolific Mellencamp.